Press | Lee Lee's Rugelach | The most outrageously delicious homemade rugelach in New York! I put in a lot of hours with no pay—just out of love, With flour and water, I can create something perfect. Can't beat that, right? He's the rugelach king of Harlem. Alvin Lee Smalls' obsession with the buttery nuggets began more than four decades ago when he stumbled onto a recipe in a newspaper and launched his quest to create his own version of the traditional Jewish treat. Alvin Lee, the owner of Lee Lee’s Baked Goods in Harlem, may be one of the last commercial bakers in New York producing traditional butter-dough rugelach, the Austrian-German-Jewish cookies that are like tiny strudels. ...Mr. Lee’s rugelach are buttery, magnificent, and fleeting. He says he came out of retirement, after a 30-year professional baking stint, determined to master the rugelach genre. “I couldn’t find one that I wanted to eat, with all the old Jewish and German bakeries closing,” he said. “So I had to make them myself. On a shady side street in South Harlem, my grandmother’s rugelach met its match. 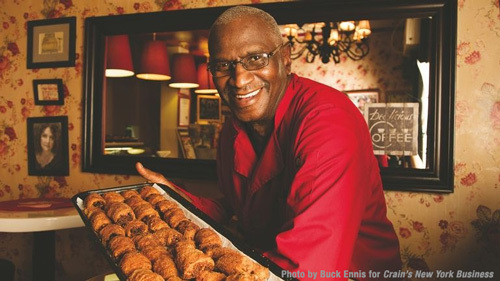 At Lee Lee’s Baked Goods, Alvin Lee Smalls serves “Rugelach by a Brother”-flaky crescents available with either apricot or chocolate filling. Mr. Lee has been making rugelach for 48 years, and experience shows in each carefully curled pastry. ...There is simply no substitute for soulful rugelach and well-weathered walls. I have a confession… I used to be a commercial rugelach kinda gal. The actual bakery variety never tempted me. I always enjoyed the chewy, soft, slightly Pillsbury-like texture of Green’s cinnamon rugelach and the house brand from Zabar’s. I couldn’t even keep a bag of them in my apartment for fear of unfettered overindulgence. As traditional bakeries have disappeared on the Lower East Side, Small’s reputation as the rugelach maker of Manhattan has only grown with help from mentions in the New York Times and raves on Yelp. From 5:30 a.m., he bakes them fresh throughout the day, but will often run out and have to close the doors until the next batch comes out of the oven. Not too long ago I had guests in town visiting from Florida who once lived in NYC. They wanted to walk the streets of Harlem. So I took them down the fabulous and famous Frederick Douglass Blvd. We get to 118th Street and FDB; and we see this adorable candy-striped awning with lovely tree stands. As we get closer, this amazing sweet smell creeps in. Alvin Lee, the owner of Lee Lee's Baked Goods in Harlem, has been making rugelach for more than 50 years and he knows what authentic rugelach should be like: a bite should transport you back in time to your nana's/bubbe's/grandma's kitchen. His hand-crafted rugelach are buttery, magnificent and fleeting as he is one of the last commercial bakers in New York producing traditional butter-dough rugelach.